What a great place. We really enjoyed our stay. The cabin has everything anyone needs the place is clean and comfortable and the scenery is magnificent. Great Smokys Cabin Rental team members were very professional and polite. The team members were very helpful and made it a great experience in every aspect of our vacation. From booking our reservation, to getting information on the cabin, the directions were very clear and easy to follow, when we had questions they were answered in a timely manner, and when we needed assistance at the cabin they sent a team member (John) and he was very helpful and kind. John went above and beyond to ensure our stay was great! Bear Moon Lodge is amazing. Everything about this cabin location, and the people are amazing! We plan on making many more memories and returning for many years to come. This is Heaven on Earth. The kids loved the play room and my husband and I lived the hot tub! Thank you again. Cabin was exactly as described, it actually had one more bed than advertised which came in handy. It is only about 5 minutes from Harrah's and was only 20 from the majority of the white water rafting places but was still secluded enough to not even know we had neighbors. Overall excellent place that is only a stone's throw from anything you want to do in the mountains. Everything about this place was amazing. We came to celebrate our first Anniversary and we were very impressed. Definitely coming back. Thank you for the great memories we made here at Bear Moon Lodge. We had a great time, everything was better than expected. House was clean, instructions to get in/check out were accurate, no problems whatsoever. Would definitely stay here again! Everyone we communicated with was knowledgeable and very helpful. Last minute rent/reserve and last minute changes without a hitch. Pleasure working with everyone at GSCR! Place and location is amazing. Already planning a longer trip.. We came to celebrate our 24th anniversary. I booked on internet but response from team very fast. We rented the Bear Moon Lodge for our daughters graduation weekend from Western Carolina. 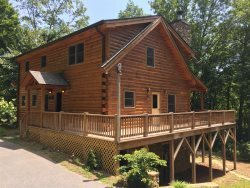 Our family loved the cabin, we enjoyed the pool table and gas logs the most. It was a nasty weekend, and wish we could have enjoyed the deck more, the mountain views are beautiful. Your cabin was awesome. We had such a great time with all the amenities. We will be back again. The cabin was clean and fully furnished. Our boys had a great time with the fire pit making s'mores. My family thanks you for allowing us to rent this place.